An in-depth guide to ideas, concepts, and other information related to roleplaying at 'Souls RPG! This Species Guide covers all Luperci–capable species in the game, though players are never required to play a Luperci character. Players can play a species not on this list (e.g., a black bear) but they must join the game as a Creature and are incapable of ever becoming Luperci. North American species are naturally most common at ‘Souls. If you wish to have a character originating from outside of eastern Canada, make sure you have a plausible history and explanation as to how they got there. The Travel page can help you with that! 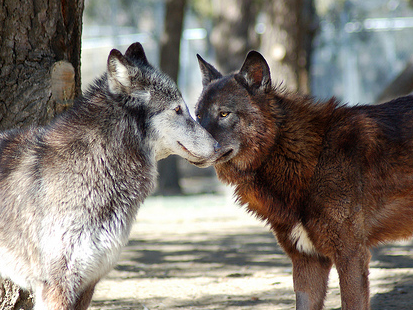 The main species pages (e.g., Wolves, Coyotes, Dogs, and Jackals) discuss each species as a whole. 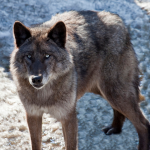 Please refer to specific subspecies pages if you’d like further information about a given subspecies (e.g., an Arctic Wolf or an Egyptian Jackal). North American native Canis lupus tundrarum (Alaskan Tundra Wolf). Siberian Huskies and similarly wolfish dogs are likely to survive in the post-apocalyptic world. 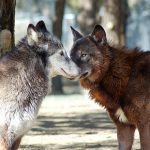 Wolves, Coyotes, Jackals, Dogs, and all other Luperci-capable species—that is, species within the genus Canis—are able to interbreed and produce fertile offspring. A 2010 survey of 57 characters (out of approximately 120) was used to obtain the data for this graph. 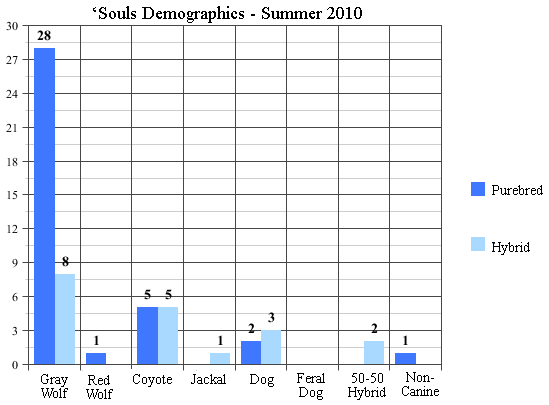 ‘Souls has always had a dominant wolf population. 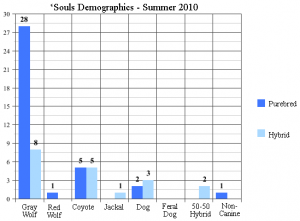 Minority populations tend to concentrate in specific packs, such as coyotes and coyote hybrids in Inferni and dogs and dog hybrids in Cour des Miracles. 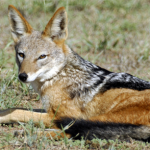 Individuals of exotic species, like the New Guinea Singing Dogs and the Ethiopian Wolf, have also made it as far as ‘Souls, though they are quite rare. 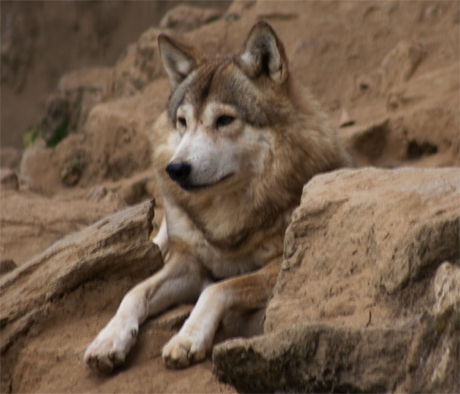 Canine species have reclaimed as much of their original territory as possible. 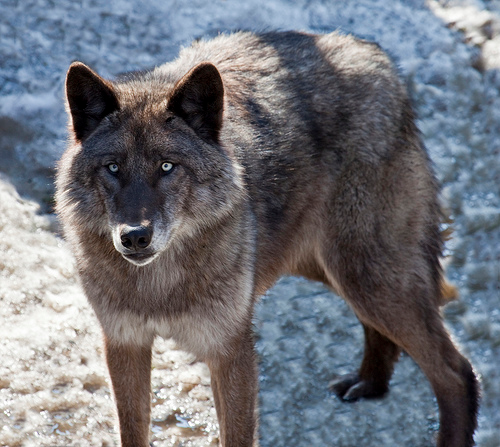 For example, North American wolves had long been exterminated from the southern extremes of their range by humans, but since the apocalypse, they have reclaimed much of these territories. All Luperci-capable canine species where they are dominant populations across the ‘Soulsverse. 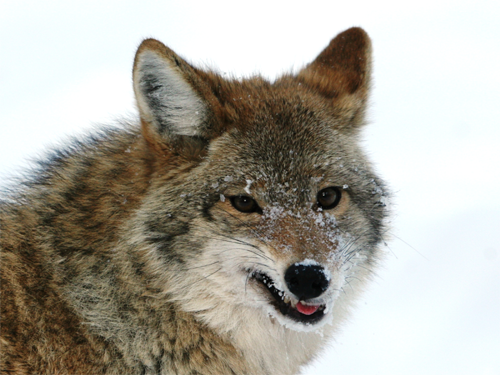 In some areas, hybrid populations dominate: for example, the southwestern and western United States have dominant populations of coywolves, coydogs, and wolfdogs, though purebreds of these three species exist as well. Although dogs are found virtually everywhere, the only continent where they are the dominant species is South America. 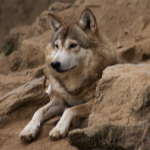 Many areas are home to multiple competing species or subspecies — for example, dogs, red wolves, coyotes, and gray wolves can all be found in the southeastern United States, while many types of wolf, jackal, and dog can be found in the Middle East and eastern Asia. 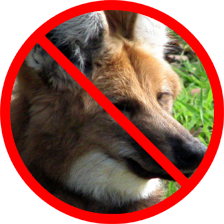 Maned Wolves and other non-Canis species, such as African Wild Dogs and foxes, are playable as Creature species — but they are not able to become Luperci, as they are not of the Canis genus. 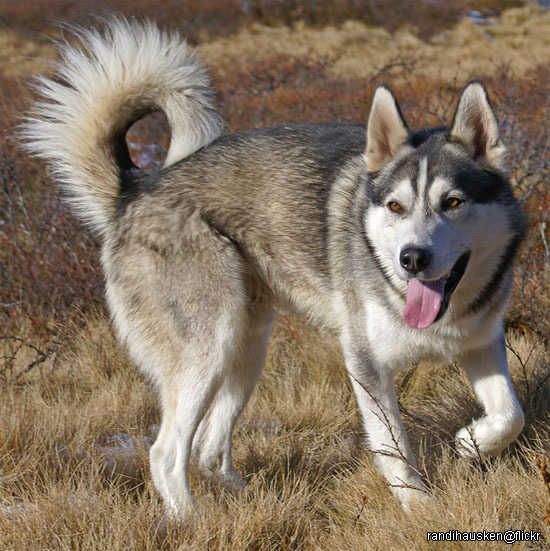 The Luperci gene is incompatible with species outside of the genus Canis, including other visually similar canines in the family Canidae. While these animals are playable in ‘Souls as Creatures, they are not capable of becoming Luperci. 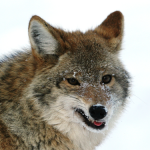 Additionally, “exotic hybrids” — that is, hybrids of canines in different genera — such as a Fox-Wolf hybrid, or a Dhole-Jackal hybrid — are not allowed. If you choose to play a non-Canis species of Canidae, your character will only be able to breed with their own species. Foxes (Vulpes) are not in the genus Canis. The same goes for Dholes (Cuon), Short-Eared Dogs (Atelocynus), Culpeos (Lycalopex), Bush Dogs (Speothos), and Raccoon Dogs (Nyctereutes). African Wild Dogs (Lycaon) are not in the genus Canis. 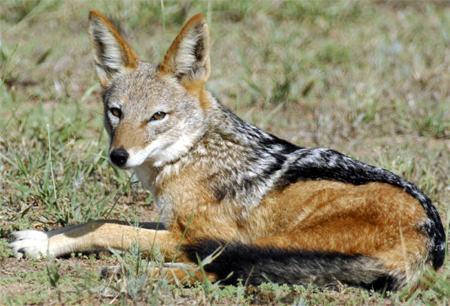 Neither are Maned Wolves (Chrysocyon). Hyenas are not in the genus Canis — they aren’t even in the family Canidae! Take special care — many species’ common names are misleading. African Wild Dogs, Short-Eared Dogs, Bush Dogs, and Raccoon Dogs all are not Canis-genus Dogs. Maned Wolves and Falklands Wolves are not Canis-genus Wolves — and Falklands Island Wolves are extinct, anyway! If you are very set on the appearance of a non-Canis species, you can cheat somewhat with coat patterns — all of the listed canines have analogues for coat patterns in the Canis subspecies, even the African Wild Dog with tweed merle coat patterning (note: this is very rare!). Overwhelmed? Start with the Quick and Dirty Guide to 'Souls and read more from there! Questions? Check the FAQ, then try the Questions and Help forum. If you're still lost, contact a member of staff! © 2001 - 2019 'Souls RPG. All rights reserved.